bottle, Auchan Illkirch-Graffenstaden, France. Dark golden, mid-sized white head. Malty with some dark fruits. Slightly sticky palate. Bottled 250ml. -from Geant Albertville. 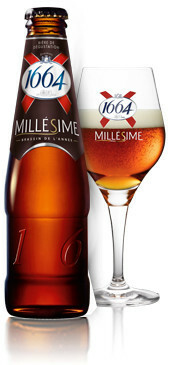 Darker golden coloured, small off-white head, mild presence of alcohol in rather malty nose. Sweet malty, slight fruity and honey with mild alcohol notes. Touch of spices in rather sweet finish. Not bad. Humm une bonne bière facile à trouver un peu partout. J’aime son côté caramel et un vrai goût, agréable et mousseuse et avec une belle rober rousse orangé. Ce qui me plait est le fort gout malt et caramel sans être très amère. Bottled, thanks Bov! Clear amber, small head. Appley nose. Sweet and syrupy with medium body and sticky mouthfeel. Fruity with some buttered caramel. Low bitterness. Bottle. Pours a pale amber color with a small white head. Has a fruity malty spicy weak yeasty aroma. Sweetish malty spicy weak yeasty caramel flavor. Has a fruity malty spicy yeasty caramel finish. Bottle at Papsø. Clear golden coloured with a small white head. Sweet and malty aroma of caramel with notes of bread. Sweet flavour of malts and caramel with notes of bread. Sweet finish. 25 cL bottle. Pours clear and golden orange with a small off white head. Aroma is grassy and light soapy. Bitter, toasted malty and light herbal. Caramelish and toffee malty. Bitter and light grassy finish. Mild marcipan note.